Forges, Blacksmith Forges and Anvils are used to create armor, jewelry, and weapons out of raw materials (ingots, leather, etc.) in the original version of the game. If Hearthfire is installed, you can also create certain housebuilding materials. There is no functional difference between an anvil and a forge. Forging is controlled by your Smithing skill, and is the fastest way to gain Smithing experience. The types of equipment that you can craft depend upon which Smithing perks you have unlocked (with the exception of some specialty items that can be crafted at the Skyforge). Forges can be found at every Blacksmith in Skyrim. They are also found in various other places throughout the province, including outside many mines and inside several dwarven ruins. The Forges category lists locations that contain forges. The following table summarizes all of the types of items that can be crafted at forges. In most cases "Armor" means a complete set of armor (cuirass, boots, gauntlets, helmet, and shield). The same is true for "Weapons": most types are available for forging (daggers, swords, war axes, maces, greatswords, battleaxes, warhammers, bows, and arrowsSee Notes). Details of every item and its materials are provided on the linked pages. The Aetherium Forge is a large forge added by the Dawnguard add-on. It can be found after reading a book called The Aetherium Wars and beginning the quest Lost to the Ages. It can only be used once to create one of three unique items: the Aetherial Crown, Aetherial Shield, or Aetherial Staff. More details can be found on its main article. The All Forge is an anvil found within Myrwatch Gallery, added by the Myrwatch Creation. It functions similarly to both Gunmar's forge and the Skyforge, allowing you to craft items usually restricted to one or the other. It also functions similarly to the forge in Skaal Village, although that forge actually has no special crafting options available to it. 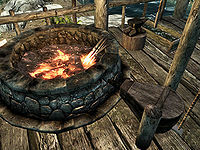 The Atronach Forge is not a true forge, but rather an arcane conjuring device that magically transforms provided "offerings" into other items — e.g., hostile atronachs, staves, spell tomes, scrolls, and Daedric items. Using the Atronach Forge does not require any Smithing skill, nor does it provide any Smithing experience. The forge is located in the Midden under the College of Winterhold, and is detailed on its own article. Gunmar's forge, added by the Dawnguard add-on, appears in Fort Dawnguard after recruiting Sorine Jurard and Gunmar during A New Order when allied with the Dawnguard. It is similar to other forges in nearly every way, without a unique appearance. However, it is the only forge in the game where crossbows can be crafted, as Sorine will tell you during gameplay. While base crossbows (and enchanted versions) and steel bolts can be acquired from various NPCs, and Dwarven bolts can be acquired from Dwarven Automatons, all other varieties of crossbows and bolts can only be acquired by completing specific versions of Ancient Technology. The Lunar Forge is located at Silent Moons Camp northwest of Whiterun. On a Workbench near the forge is a book called Notes on the Lunar Forge, which suggests that weapons smithed here will convey a "lunar" damage bonus at night when the moons are out. There are several random Lunar weapons around the forge, which do have these properties. However, the Lunar Forge cannot actually be used to create new Lunar weapons. Instead, "Silent Moons Enchant" is an enchantment that can be learned by disenchanting one of the Lunar weapons, and can then be applied to any weapon at any Arcane Enchanter. The book also states that the weapons will transfer life from the victim to the wielder, suggesting an Absorb Health effect. This is also false; they merely do more damage. The Skyforge, located adjacent to Jorrvaskr in Whiterun, has unique smithing properties. After the quest Glory of the Dead has been completed, speaking to Eorlund Gray-Mane will cause him to describe the forge as being more "awake". Ancient Nord armor and Nord Hero weapons will now be available for smithing at this forge only, as detailed on the Skyforge page. However, it is impossible to ever forge Skyforge Steel weaponry. If you jump into a forge, you will be set on fire, which will slowly increase your Destruction skill. This does not happen with the Skyforge, however. This issue has been addressed by version 1.2 of the Unofficial Skyrim Patch; this no longer gives you Destruction experience at any forge. Arrows and bolts can only be crafted after installing the Dawnguard add-on. This page was last modified on 21 January 2019, at 01:00.